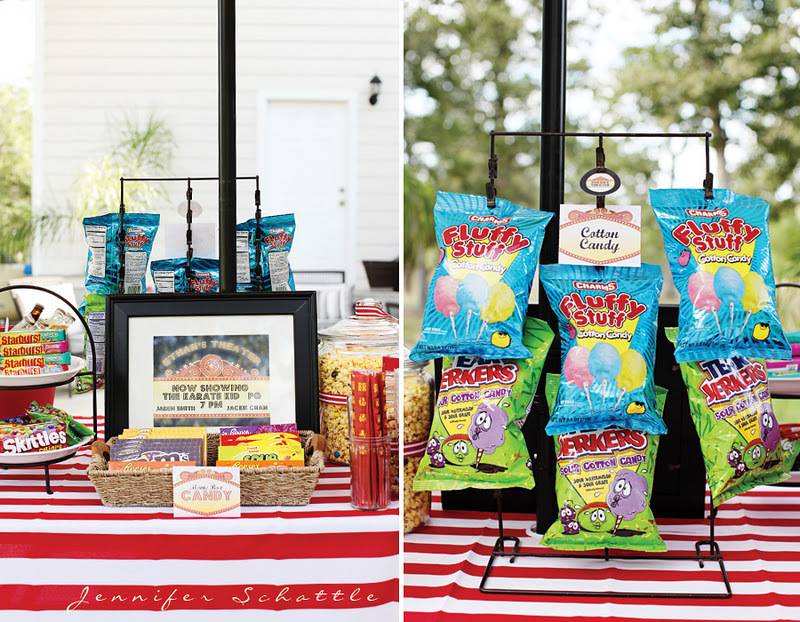 My first weekend party feature goes to this fabulous NIGHT AT THE MOVIES BIRTHDAY PARTY submitted by Jennifer Schattle. Grab some popcorn and take a seat...this party is one that can't be beat. 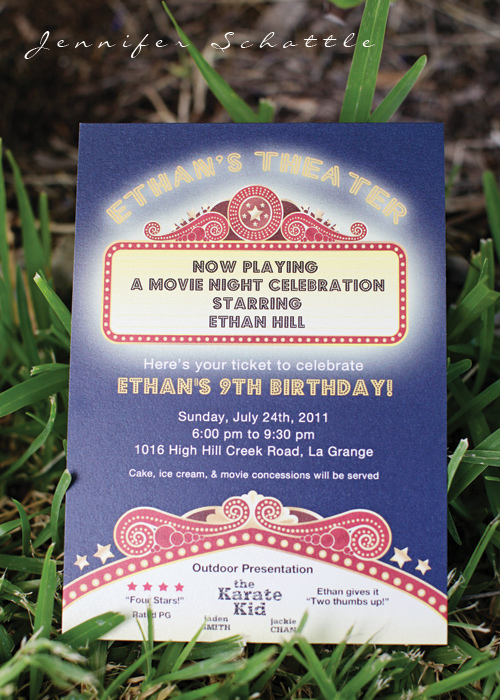 "My son, Ethan, was turning 9 this year, so I was facing the dilemma of what kind of party to throw that he would love. And would be 9-year-old "cool" too. 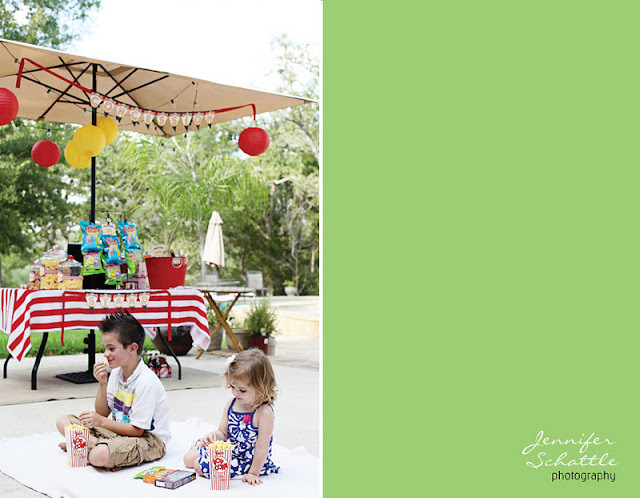 Since he has a summer birthday, we always do outdoor parties, and I knew this year wouldn't be any different. I went down my checklist: Camping? Done. Pool party? Done. Circus? Done. Picnic? Done. My parents had just installed a new flat screen television on their back porch. Outdoor movie? That's it! Ohhh, and I love the old theater marquee look, so let's go with that theme - a cool, vintage Hollywood outdoor movie theater! Then he chose his favorite movie, The Karate Kid (2010) with Jaden Smith and Jackie Chan. My ideas were brought back to a 9-year-old reality, and, really, it was all about what he wanted. Vintage Hollywood was out. 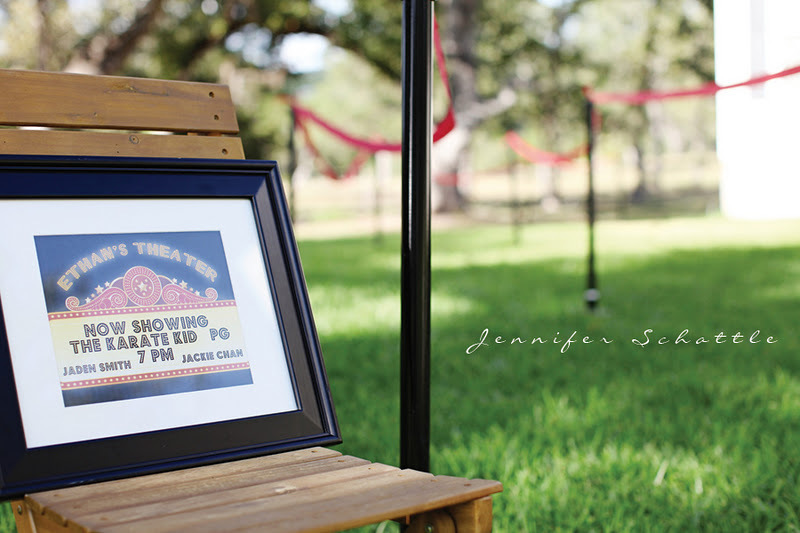 For the invitations, I used midnight blue as the background - appropriate for our evening/night event. I still incorporated the old-style theater marquee that I loved, and that was the springboard for the rest of the paper goods. The marquee colors had yellows and red which was perfect for the movie he chose since it takes place in China. 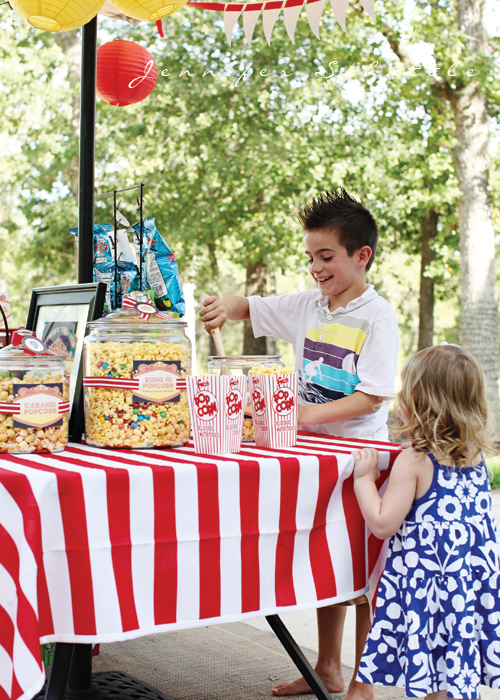 We had the theater, but you cannot go to a movie without going to the concession stand first. We needed a concession stand. I had the idea of marrying a concession stand with being outdoors, so I used a very common umbrella table. Voila, we had a 360 degree concession stand. Very cool for 9-year-olds. Candy all the way around! The red-striped tablecloth was a great find from Target. It zipped around the umbrella! Party lights were hung around the umbrella ready to be lit at dark. 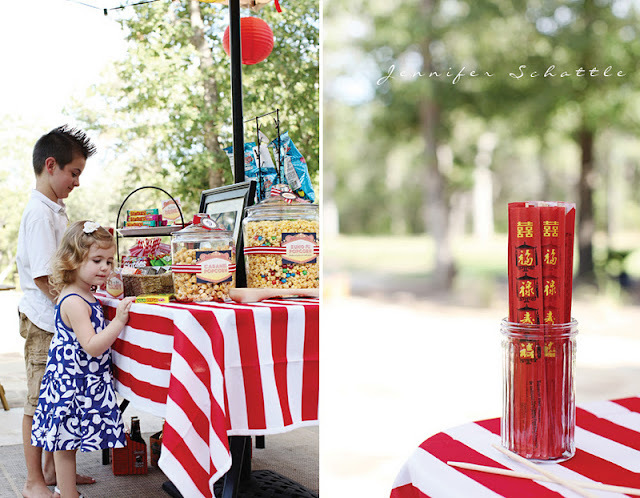 I used red and yellow paper lanterns from Party City hanging from the umbrella, keeping with the colors of the invite and movie setting. "Ethan's Theater" concession stand was stocked on one side with the staple movie box candy - m&m's, starburst, skittles, reese's pieces, bottle caps, etc. 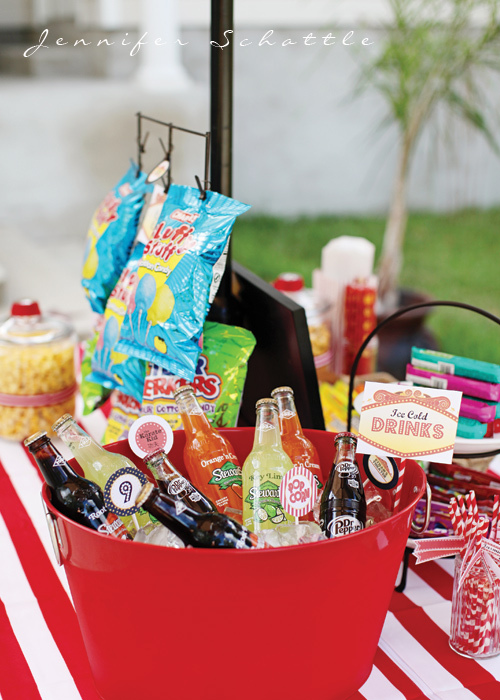 I used a basket I had for the box candy and my mom's food stand for the other candy. Drinks were outdoor style - glass bottle sodas in a red ice bucket also from Targe t. We weren't having cupcakes, but I had to tuck in a few cupcake toppers into the ice bucket. 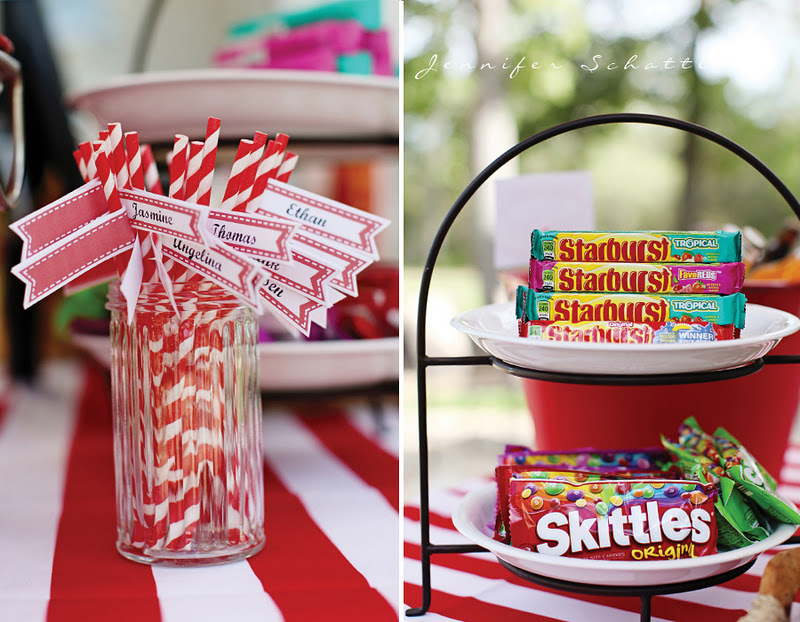 Red-striped straws (from Hey Yo Yo) with personalized straw flags (Hey Yo Yo) were a must for the drinks. That way the kids could keep up with which drink belonged to who. Let me tell you, they loved having their own names on the straws! The other side of the concession stand had the cotton candy. My sister-in-law has a vintage chip clip stand that I used to hold the cotton candy packages. So neat. The kids just pulled the cotton candy off of the clip and were off to the movie. Of course, the main attraction of the concessions had to be the popcorn. Buttered popcorn was a must. Ethan requested caramel popcorn. 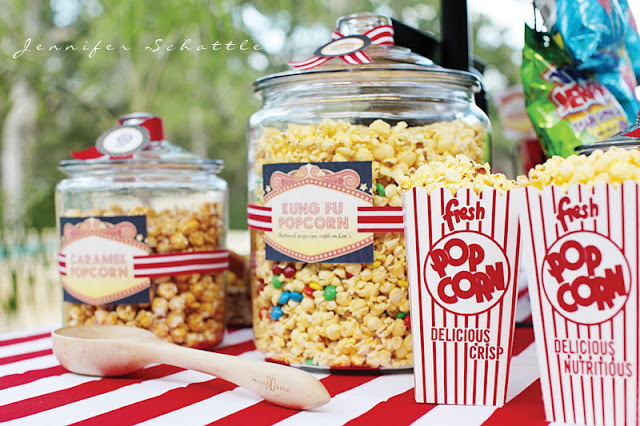 I mixed buttered popcorn with m&m's and called it, appropriately, kung fu popcorn. All the popcorn was easily reached in lidded jars from Walmart and a wooden scoop was available to help scoop out the popcorn (also from Walmart). 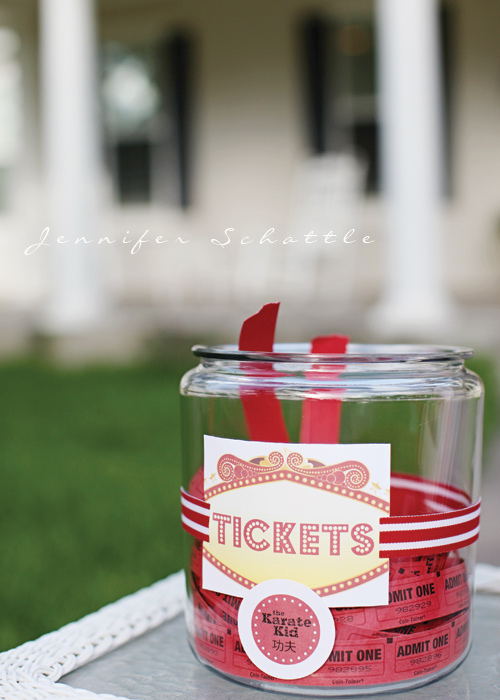 I hung more of the personalized party circles with ribbon around the jar lids. Popcorn boxes (Hey Yo Yo) were just the perfect serving size for the movie. Finally, we had chocolate covered fortune cookies! We couldn't watch The Karate Kid without having fortune cookies. I picked up the fortune cookies from our favorite local Chinese food restaurant and dipped them in chocolate. These were a huge hit with the kids and adults too. 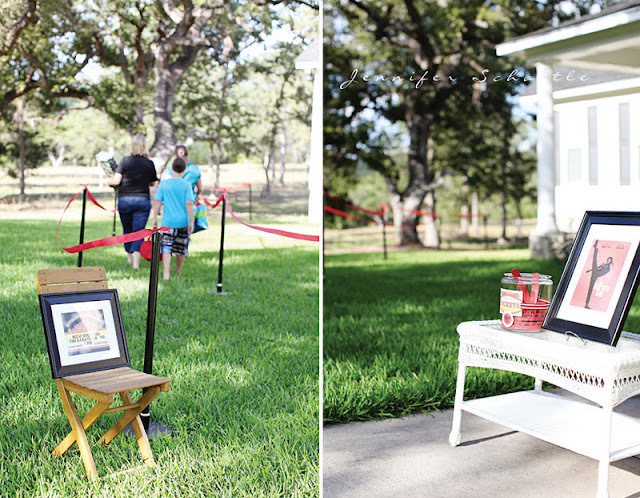 At the party entrance, I used red crepe paper and stands borrowed from a friend as the red rope entrance. It lead the way out back to the party. Very V.I.P. I also placed a "now showing" sign along with a small Karate Kid poster at the entrance next to a jar of red "admit one" tickets giving the entrance a movie theater feel. At many theaters, you will find photo booths. I thought it would be fun to have an outdoor photo booth to take pictures of Ethan and his guests as they arrived. Well...the best laid plans of mice and men...it didn't work out exactly as I had pictured, but the end result was still just as cute. It was too windy that day and the sheet wouldn't hang, so we just had the photo booth in the great outdoors. I provided different hats and cardstock mustaches from the Cupcake Social as the props. 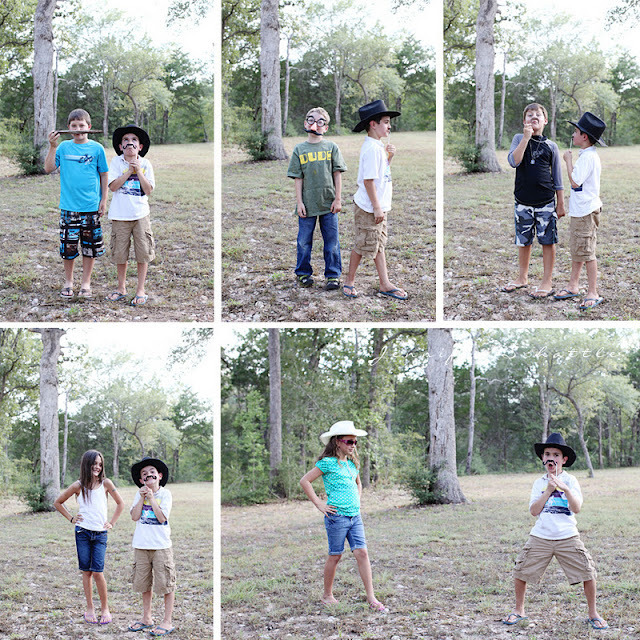 All of the guests hadn't arrived yet, but my friend and photographer, Jennifer Schattle, did an amazing job capturing the kids' personalities that were there for the shoot! They even attempted their own kung fu moves! After the photo shoot, we played one quick, prize-winning, game: the great popcorn eating race. with chopsticks. Each guest and the birthday boy were given the same number of popcorn pieces and a pair of chopsticks. The object was to race and see who could eat the popcorn the fastest using their chopsticks. 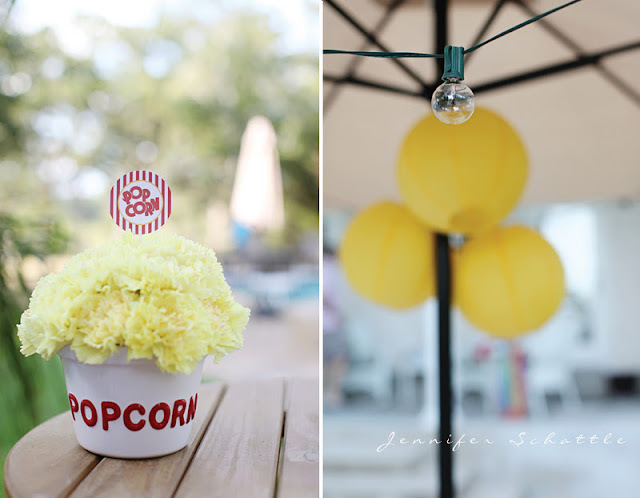 Popcorn was everywhere! It's a wonder that we had winners. We played this game a couple of times and had a blast. Ethan requested a popcorn cake. I am no baker, but I love to make my children's cakes/cupcakes every birthday, so I had a challenge ahead of me. I have to credit Bakerella for the inspiration. She has the popcorn brownies on her website, and I used her technique with the marshmallows to place over the cake. And truly, I have to credit my husband for finishing the cake! I burnt out scoring the marshmallows and he swooped in to double and triple up the marshmallows making the popcorn effect even better. 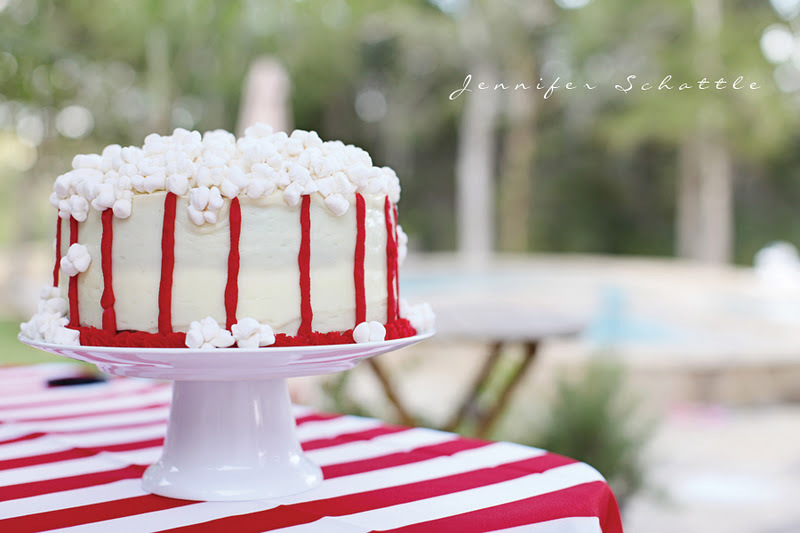 While I was decorating the party that afternoon, he placed every marshmallow "popcorn" on the cake. What a dad! 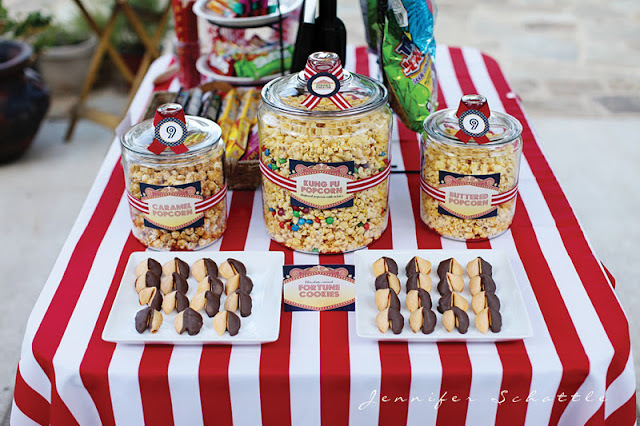 Finally, after the birthday guests enjoyed the movie, they took home their party favors stuffed inside a popcorn bag (from Hey Yo Yo). It was definitely a night to remember and, most importantly, Ethan said it was the best birthday party ever. I agree."